Anything Good On BBC News At Ten? Kamal Ahmed last night reported from Dublin on Ireland’s corporate tax regime. No longer do we see old fellas in flat caps on stools suppin’ pints of stout, with an uilleann pipe soundtrack. 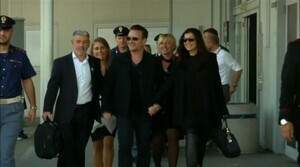 It’s all tax avoidance and Bono. Posted in Misc, Politics and tagged BBC News, Bono, Corporation Tax, The Double Irish at 9:49 am on October 15, 2014 by Admin. Iggy Pop tore U2 a new Bono yesterday. Not to get all down on the BBC or anything but what they explained was not the “Double-Irish” which has to do with Irish companies listed for tax purposes where management meets, and with tax write-offs for patents. There might be a point in there, but after reading your comment twice, I can’t find it. Your comment is practically incomprehensible. + 1 tax geek here. Nothing wrong with what they’ve shown… Ireland leading the way… England suggesting they will follow in our footsteps. The double Irish is dubious, and I’m all in support of R&D incentives, so win-win. They could have left Bono out of it though. I don’t mind the world knowing we have reasonable tax rates, it’s good advertising for the country. Also impressed with the fact that Noonan was very rigorous in his support of Irish tax policy yesterday. Sorry for royalty payments on patents. Type in haste repent at leisure, as they say. By bowing to peer (US and UK government) pressure, will this effect the number of multinational companies in Ireland? I don’t think so. But it will effect the number of shell operations. Not true, double Irish had nothing to do with shell companies. You can’t have a shell company and get the 12.5% rate in Ireland simples. 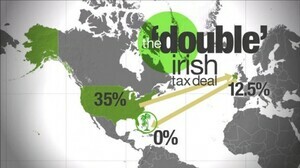 The double Irish was about US tax rules which deemed payments between two Irish incorporated companies to be a nothing. If the Irish incorporated company receiving the payments (because it owned the IP) was tax resident in a low or no tax jurisdiction this gave the group an overall benefit. Ireland was not being screwed out of anything, the IP was never owned or generated here. People need to understand that there is a difference between where a company is incorporated (where it is formed from a company law perspective) does not and should not equate to where it may be taxable around the world. So, when does this come into effect? Does this mean multi-nationals will all now start actually paying the 12.5%? Will that signal a tax windfall for Ireland from that sector for next year… it should, shouldn’t it? Very obvious questions, but sure politics never actually does what it says…. does it..
….always some sorta delay. New taxes for the populace, and Queen Fairy Noonan snaps his fingers… tada! New taxes for corporations, ah now, well, let’s all sleep on it. 2015 for new companies and 2020 for existing ones as far as I remember..
no really clampers outside! The corporation tax rate is just a headline figure, something to put in the shop window. The real avoidance is in the secondary write-offs and exemptions. A good guide to all of this is this report done by Richard Murphy for ICTUNI. Although the report is about Northern Ireland, it covers the southern Irish situation quite well. By the way, the 12.5% and 25% corporation tax rates and secondary tax write-offs apply to both Irish and multinational companies in Ireland – including people who have set themselves up as companies for tax purposes such as Joe Duffy, Marian Finucane and Pat Kenny. The is no “special rate” for multinationals. The entire state is a special tax zone. That is why in 2011 less than 40,000 companies in Ireland paid any level of corporation tax, with 2/3rds of the amount coming from 129 companies. It appears that the majority of companies in Ireland do not pay any rate of corporation tax. I seriously doubt that multi-nationals will start to pay 12.5% corporation tax in Ireland Clampers. I’m sure that Amazon, Google and Apple’s tax departments are working out right now how to keep their effective tax rate close to 0%. And I reckon they’ll succeed. What the Irish government has done is a step in the right direction, but it will take much more – on a global scale too – to get corporations to start paying tax. Anywhere. The first thing I thought when he said they were phasing out the “double Irish” for existing companies was that there must be some sort of catch. They’ve probably already struck some sneaky deal with those big multinationals like Google. They’ll pay 12.5%, they just wont be shifting all of their profits through Ireland anymore. Pay the 12.5% rate on what? These Irish tax resident companies still paid the 12.5% rate on their profits (not income, profits) and this will not change. The profits may be higher in Ireland however if the new patent regime is attractive enough for theses groups to locate and develop their IP in Ireland then great. The oul walk among the red yokes shot has gone global. One of our greatest export that. Some type walking amongst the red yokes talking about stuff on camera. They’re crazy, those red yokes. Wacky, like our tax system! You could sell the clip to Harry Hill if you walked into one of em by mistake. In other news, it never fails to amaze me how titchy Bonio is. What has Bono done for Ireland? 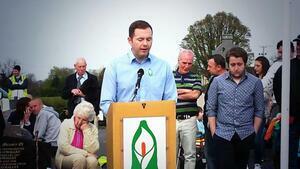 Seriously, what charities does he support in Ireland? Has he put money into any social projects? He’s kept Adam Clayton in continuous employment. He’s starting to look like that other weasel, Sean Penn. Lose the shades, it’s not that sunny or you wouldn’t be the only ones wearing them. As yer man from Kiss said on Through The Keyhole recently (boom! ): “The sun never goes down on cool”. What’s the song at the start of the video. Very catchy. I could really go a double Irish now after the few pints last night! Noonan announced this in the budget at 2:30pm, BBC Economics reporter flies to Dublin and does a walk in the red yokes in daylight for a report for the 10pm news. Or did the reporter prepare in advance. How would he have known. Or was it the Dublin reporter being retitled as an Economics reporter. The closure of the double Irish was known the day before the budget. There was an article on the Wall Street Journal.